For most people, what generally comes to mind when people think about chocolate are images of truffles, steaming cups of hot cocoa, decadent cakes, and warm chocolate chip cookies. But familiar to any true Chocolotarian who has researched the origins of chocolate, it was a not always a sweet confection. The use of the cocoa bean for consumption can be dated back to 1900 BCE but it wasn’t until the 1500s that Europeans added sugar and honey to cocoa and evolved it into to the sweet treat we enjoy today. I’ve always been intrigued with how chocolate could be used to prepare savory dishes. What I found most common was using cocoa to make Mole, which in itself is deceiving because it is a single word used for a broad array of sauces, many not using chocolate at all. But this blog post is not about Mole but using chocolate in a savory dish. The following recipe combines many of the most common spices used in Mole but adapted to work in a braised dish. 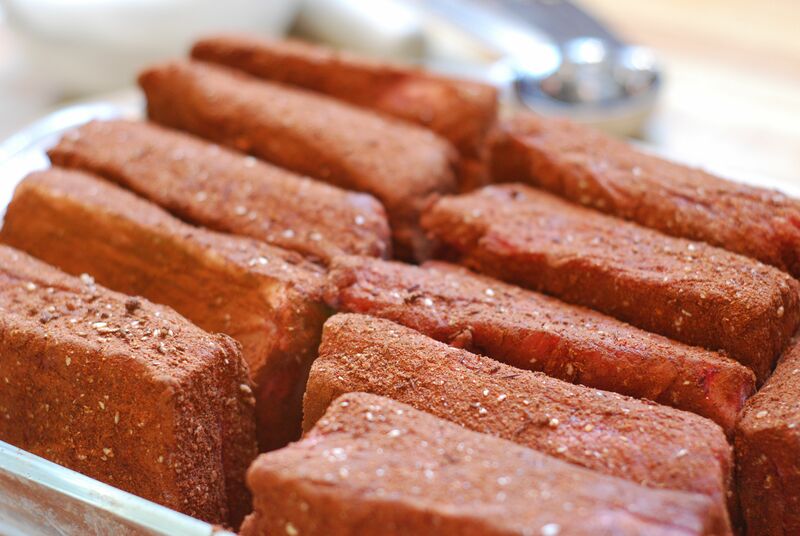 The spices are combined to create a dry rub which becomes infused into the dish during the long braising time. 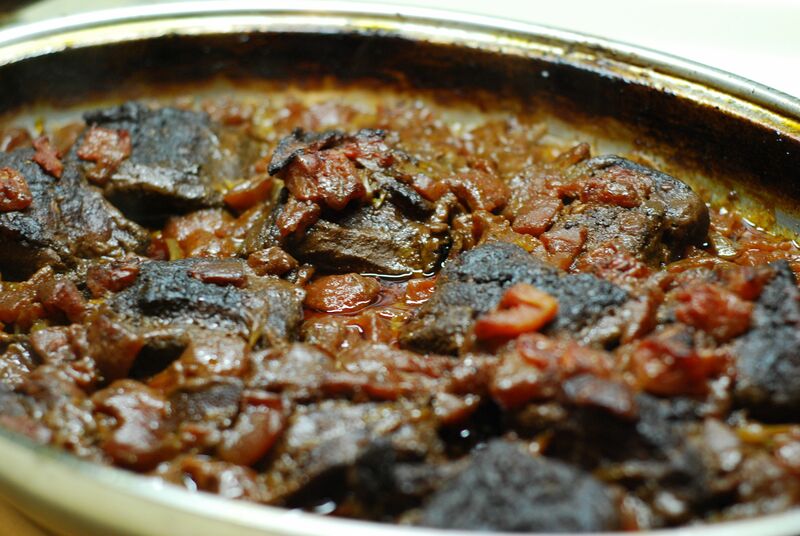 NOTE: I recently tried this recipe using lean stew meat and was very disappointed at the results. The dish lacked the hearty beef flavor that short ribs provide. The beef was dry, did not meld well with the herbs, and the overall flavor was surprisingly tart. There was relatively little fat to skim before serving but for this recipe stick with the fattier full flavor of the short ribs. This recipe is inspired by Mole but instead of making a sauce, similar herbs are used as a dry rub. Despite the strong complex flavors of the various seasonings in this recipe, they meld together and are enhanced by the hearty flavor of the beef short ribs. In a small bowl, combine sesame seeds, cocoa powder, Penzey’s chili powder, cinnamon, coriander, cloves, salt, and pepper. Rub the herb mixture onto the beef short ribs being sure to coat all surfaces well. Preheat oven to 325°. Heat oil in a Dutch Oven or heavy stove-to-oven-safe pan. Brown bacon, being sure not to over cook (bacon should be brown and crisp but not hard or burnt). Set bacon aside and chop into ¾-inch pieces. 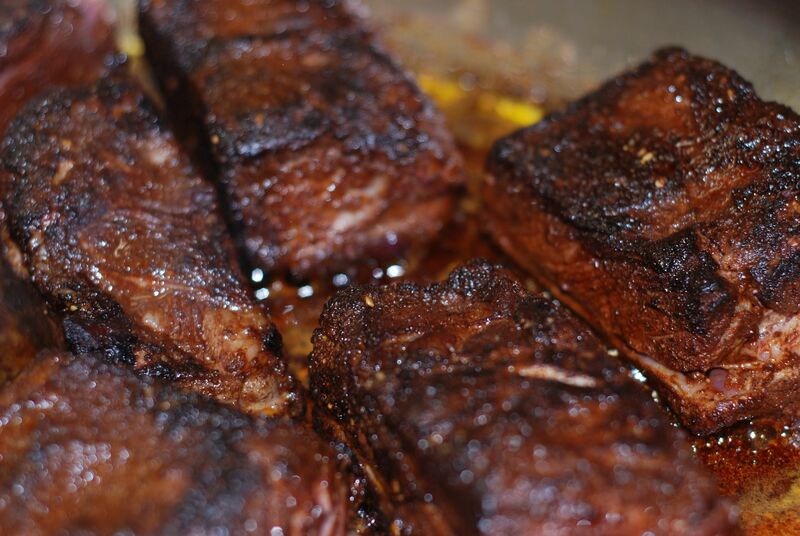 In the same pan, brown beef short ribs on medium-high heat but be careful not to burn the ribs or pan. After browned, lower heat to medium and sprinkle turbinado sugar onto ribs, being sure to get a little on each rib. Let sit for 1 minute to let sugar melt into meat. Remove ribs and set aside. 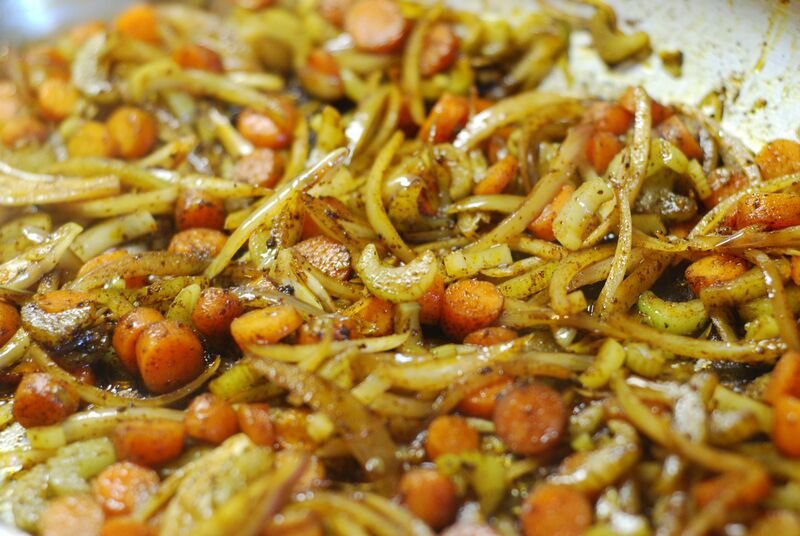 In the same pan, sauté shallots, celery, and carrots until vegetables look lightly glazed, about 3 minutes. Return beef short ribs and bacon to pan. Add tomatoes, Cabernet wine, and beef broth. Bring to a boil. Cover and place pan in the center of oven. Braise for 3 hours, checking around the 2 hour mark to see if it needs more liquid. If needed, add more beef broth. Before serving, skim fat off of top or you can make this dish a day ahead, refrigerate and remove solidified fat prior to reheating. SERVING RECOMMENDATIONS: Serve over mashed potatoes or a smooth Polenta. The ribs have a very robust flavor so this dish generally goes best with a bland starch accompaniment. I specifically used Penzey’s brand of Chili Powder because of its blend of Ancho Chili pepper, cumin, garlic, and Mexican Oregano. I recommend Wellshire Farm’s Black Forest Bacon. Remember the type and flavoring in the bacon will effect your dish. For example, if you choose a maple or heavily smoked flavored bacon it will have a significant impact on the overall flavor, which may not be bad, just an element to consider. 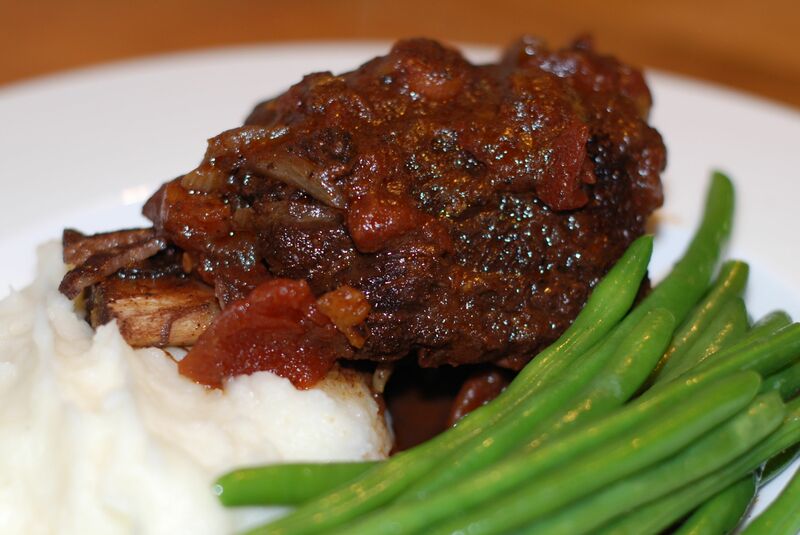 You are currently reading Chocolate Braised Beef Short Ribs at Hestina's Kardia.